Gobi-Cauliflower Manchurian is probably one of the most liked recipes in the Indo-Chinese Recipes. Which is very tasty with special chines flavors. 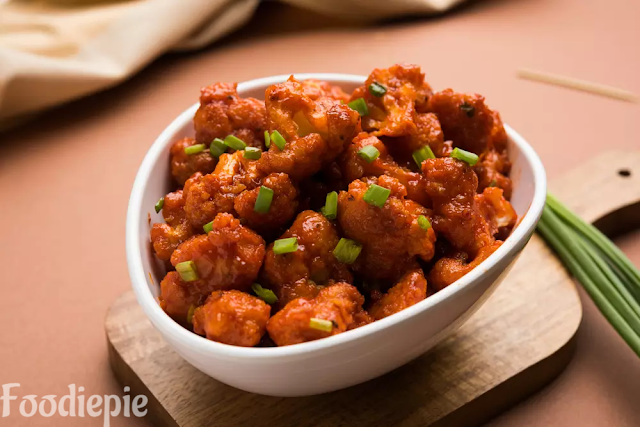 This very easy to prepare and You can make it dry or with gravy, whether you serve it as a side dish, you will also like Gobi Manchurian, which is very fond of the Indian spices.Medium-sized cauliflower florets are well-coated with a normal batter and then fried for a few minutes until it becomes crisp. Now to make sure that you do not remember anything from spicy, there is also an ideal sauce that you can use to prepare for the Gobi Manchurian. Spicy and tight sauce is made of vinegar, soya sauce, which contains a tomato puree and a salt dash, whereas Agino-moto is an optional Ingredients.The dish is healthy in the case of vegans used without compromising on tasty flavor and therefore children will love it.Let's checkout recipe first. Step 1 : Floret the cauliflower of flowers, wash it twice and keep it in the sieve and then dry the water till it becomes dry. Step 2 : Keep aside a table spoon of corn flour because we use this again in sauce preparation, mix the remaining flour and corn flour in add water and make a thick batter. Now add half teaspoon of salt and black pepper in the batter. Step 3 : Heat oil in a pan, after heating the oil, dip all dried Gobi pieces in prepared batter and fry them in hot oil until they turns in golden brown from all sides.When all done then transfer all fried Gobi in plate and keep aside. Step 4 : 1 tablespoon corn flour, which we have saved separately, Add corn flour in1/2 cup water, stir until the lumps are finished and prepare. Step 5 : Heat 1 table spoon oil in the pan.Add ginger paste and green chili in hot oil, fry a little over a low flame, add tomato sauce, chili sauce, corn flour mixture which we prepare Step 4 and soya sauce, cook for 1-2 minutes, put chili flakes, salt and vinegar, Manchurian Sauce is ready. Step 6 : Now add all fried Manchurian pieces in Sauce and add green coriander and mix it with a spoon and cook until Sauce coating on pieces of Gobi comes well. Finally :Transfer to serving plate Gobi Manchurian | Cauliflower Manchurian is ready.Garnish with coriander leave and green onion springs.Serve it with cream and ketchup.This is so simple to prepare at home hope you will enjoy it lot.